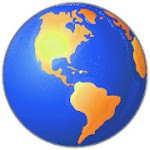 Even busy travelers need a vacation! When I returned to Baltimore on September 15, Cindy picked me up at BWI and instead of going south back to Solomon’s we headed north toward Philadelphia. Actually, we were going to Sister Jane and Sam’s house near Allentown. After a good dinner and some catching up, it was early to bed. Four AM came early on Saturday but the cars were loaded and we were off. We’re going to MacFarland Cove at South Bristol, Maine! Jane and Sam bought a summer cottage this year and we have been dying to get up there to see it. It was an easy drive of about 8 hours. We had to take two cars because Jane & Sam were heading back on Monday morning while Cindy and I were staying on for a few days. 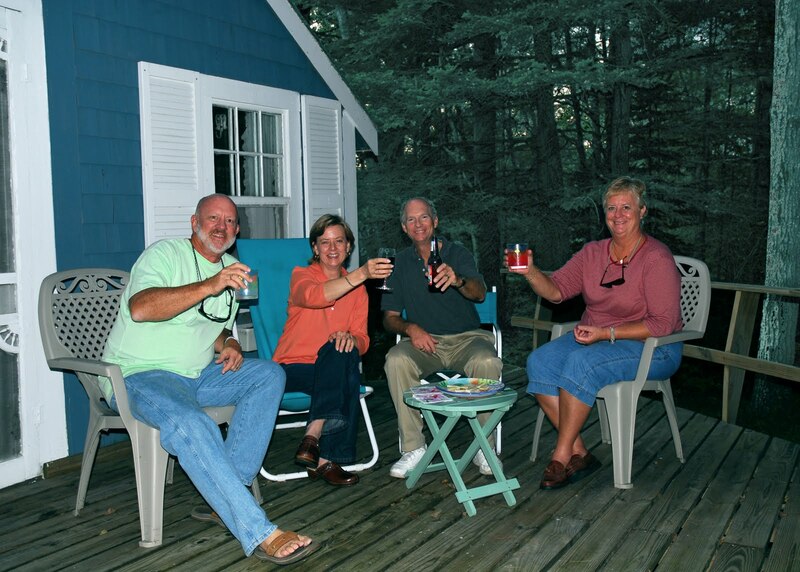 Before they left we took the opportunity to work on a couple of small cottage projects (moving stuff in, fixing the screen door) as well as sampling the wares at the Pemaquid lobster pound, Shaws Wharf, Round Top Ice Cream Shop and Schooner’s Landing, in Damariscotta. Sundowners on the deck. Cheers! Tuesday found us on the road again, this time heading to Camden. It’s another place we have visited before but it is such a beautiful spot and the boat watching is simply great. After a wonderful lunch in Camden at Cappy’s Chowder House, we were back on the road, stopping briefly in Rockland to talk to the harbormaster about the availability of moorings. Hmmm, maybe next year. It was cool at night and we were grateful that we had test-fired the potbelly wood stove before Jane and Sam left. It is amazing how quickly that thing takes the chill off the little cabin. Can we find a spot for one on Morning Star? 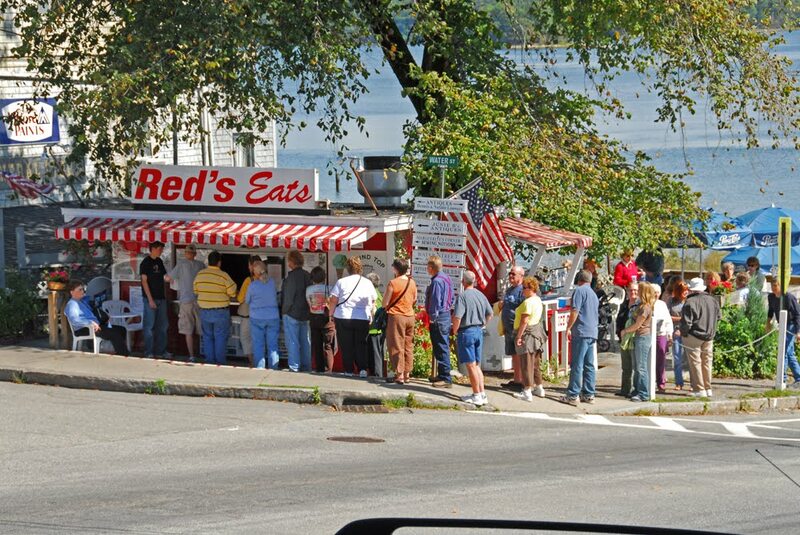 On Wednesday we went to Wiscasset for lunch at Red’s Eats, a local institution. 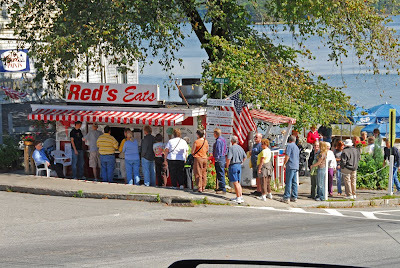 Red’s is not much more than a roadside stand, but they have made a big name for themselves selling, among other things, lobster rolls. When we drove by two years ago, people were lined up around the corner and down the block…in the rain! That was all the recommendation we needed. In the end, we preferred the lobstah rolls at Schooners, in Damariscotta, where we had lunch again on Monday after our hosts left. On our way back to the cottage we took a side trip to visit Boothbay Harbor, one of the many scenic Maine harbors. We’ve been there before but it is such a delightful place that it was worth a return trip. We were surprised to find the ship The HMS Bounty hauled out of the water, undergoing a refit. We have a passing familiarity with the Bounty since it frequently calls St. Petersburg home. The ship was built as a replica of Captain Bligh’s famous ship for the Marlon Brando movie, The Mutiny on the Bounty. (Surely you remember Captain Bligh, Fletcher Christian, Tahiti and Pitcairn Island) More recently, it played the part of Captain Jack Sparrow’s ship in the last two Pirates of the Caribbean films. Jane and Sam’s neighbors at the end of the road, the Clarks, invited us for cocktails to meet friends of theirs, Jim & Sue Chambers, who are also boaters. The Clarks were wonderful hosts and we had a great time getting to know both couples. Jim and Sue were boaters indeed, with several Trans-Atlantic crossings and a circumnavigation under sail under their belts. As they say, these folks have wrung a lot of salt water out of their socks! Jim gave us instructions to say high to his old pal, Milt Baker, on his Nordhavn 47 Bluewater. Milt and Bluewater would be in Solomon’s next week for TrawlerFest. I know Milt from the Internet, as we are both participants on a trawler-related site. It’s a small world, and I made good on my promise a week later. Thursday morning we were under way by 4:30 AM. We had a 13-hour drive back to the Bay and wanted to get it over with. Our route took us around Boston by quite a distance (but we got caught in traffic anyway), through Hartford (niece Sarah was out of town…we tried to call), through the traffic of New York City, past the industrial bustle of Camden, New Jersey (not nearly as pretty as the Camden of two days ago), down the New Jersey Turnpike (tolls!! ), briefly passing through a corner of Delaware and back into Maryland. Thirty minutes after we “closed the loop”, passing BWI, we got stuck in a whopper of a traffic jam outside of Annapolis. Patience prevailed and we got our numb butts back on Morning Star about 6 PM. Great week!